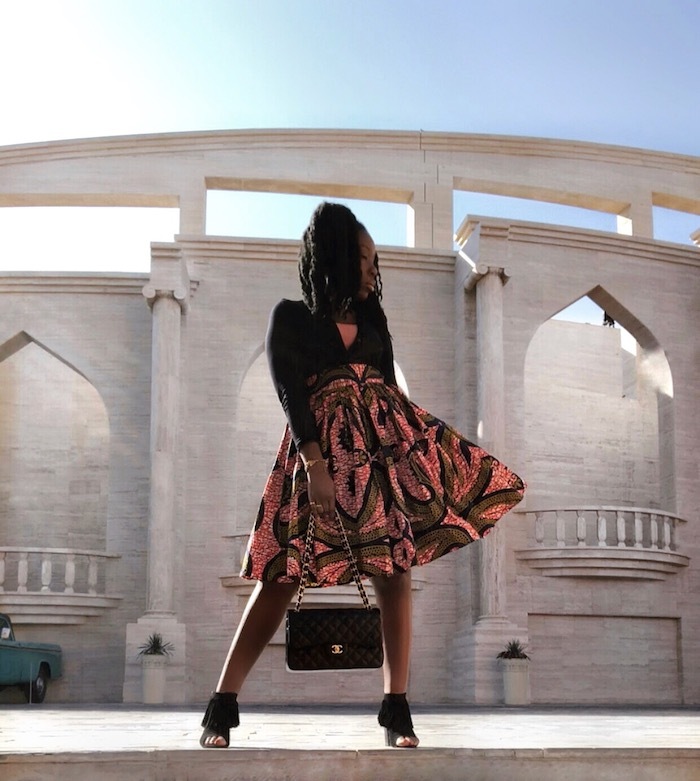 Back once again with another installment of the “Daily Fashion Fix.” This week I’ve chosen to discuss one of my favorite topics … West African prints! As African style continues to grow in mainstream popularity, I find it absolutely imperative, now more than ever, to keep the origins and history behind these textiles in the forefront of our minds … Especially as consumers of the culture. That said? In recent years, with the rise of calling attention to cultural appropriation by fashion houses, patterns with origins from the continent have thankfully begun to achieve the praise and recognition they so rightly deserve. And yet, there’s still much work and education which needs to be done. Tied closely to the history of Batik fabric shared on the Fashion Fix some time ago, Ankara fabric also has its roots in the Netherlands and Indonesia. Briefly said, during the age of European colonization, the Dutch noticed the beauty and popularity of local Asian fabrics and attempted to copy them onto various fabrics including fashion wax. While the dupe fabric proved not to be a welcomed addition to the fashion scene by the Asian community, as with most goods produced during the age of colonization, “Dutch wax” ultimately made it’s way to other colonies, including African colonies to the west. There it found a marketplace eager to welcome the new textile with open arms. Upon arriving to Ghana, the fabric began to be imbued with traditional patterns as well as pop culture symbols of the day. This practice is still done today, with patterns and symbols becoming increasingly popular and intricate. For a full history on Ankara fabric and how it became one of the hallmarks of West African fashion, check out Hyperallergic’s post on “How Dutch Wax Became a Mainstay of African Fashion” or watch this informational video below from CGTN Africa. In the end, sharing post such as these are such a passion project for me. 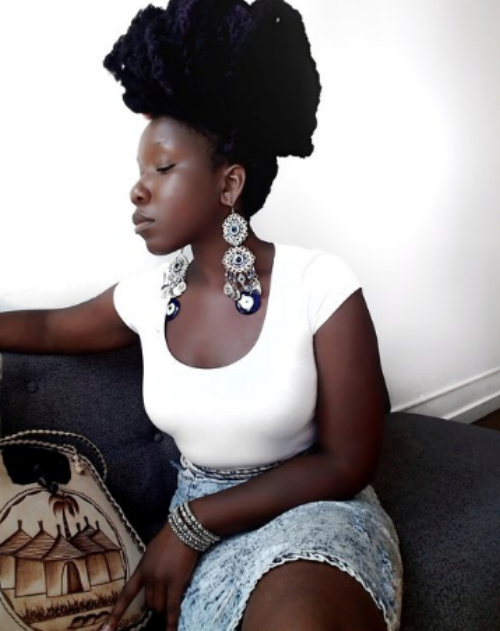 As an African-Caribbean woman finding an online tribe who not only appreciates cultural works from the diaspora, but also champions them has been, in a word, amazing! Love my style? Shop the look! For those key items which are not offered via the webstore, as mentioned in the "Amazon Favorites" post, I've taken the time to gather many of my closet essentials through Amazon to help recreate you own personal spin on my favorite looks. Those items will be noted with “buy on Amazon” … Enjoy! Looking to find your own online community? Kicksta and I have partnered up along side several powerhouse Instagramers to share 150 Tips and Tricks from Bloggers and Influencers. From health and wellness to fashion and beauty … Get tangible tips from the pros on how to find your tribe and level up your instagram feed! Hope to see you there! In this week’s Daily Fashion Fix style post, I’m getting a bit personal while sharing this week’s global style feature hope you enjoy! Let’s talk a bit about religion. My own spirituality, like my heritage, is often represented in the clothes I wear. It’s an extension of who I am .. A comfort, if you will. And while some find that sense of connection through church and other forms of traditional American worship (i.e Christianity), if I’m being truly honest? … That hasn’t resonated with me for quite some time … And looking at recent religious trends / research among “millennials,” I’m realizing I’m not alone. Today, while I ascribe to Buddhism as my life path, my inclinations toward acknowledging and praying to "Mother Universe" ... Thanking the sun for its warm rays ... Celebrating the power of the moon and stars ... Or Connecting with this universal life force through meditation is just as important for me. I'm sure growing up with my dad praying to our Ghanaian ancestors and having a den filled with books from every religion known to man, probably aided in what some might consider unconventional spiritual views/practices, LOL. In creating my 1st fashion collection back in 2015 for the Q.A.C. Webstore, my love of art and history came to the life when I had the chance to sit with an elder of the Dogon tribe. Found primarily in Mali, W. Africa, this tribe is known for their wooden masked dances, incredible architecture, and wooden artistic sculptures. However, they are most noted for their mud cloth fabric, often showcasing their ancient knowledge of the stars / universe. Interestingly enough, when American and European scientists finally interviewed the Dogon people during the 1940's, they came to realize the tribe already had extensive knowledge of solar systems .. Planet orbits .. And stars like the then only hypothesized "Sirius.” As a note, this star was invisible to the naked eye. During that time, the presence of “Sirius” had yet to be formally confirmed by the science elite of the day, however it ultimately went on to be widely known and accepted. The ancestors had so much knowledge, power, & magic with them. With a powerful history paired with unique hand-painting, I was utterly drawn to create my 1st collection and have this fabric be the foundation. In recognizing how connected the Dogon people are to the universe ... Their connection to the moon & stars .. In them, I saw bits of myself. Adwoa, daughter of the Moon Goddess Adwo (my tribal name from my Ghanaian Akan people). In all, this dress, one of my 1st garment creations was such a proud moment for me .. And I can’t wait to create more! Join the Q.A.C webstore newsletter and be the first the get all the details when it goes live this coming Spring! Thank you! Welcome to our global family! Till then the Journey Continues! n celebrating my recent travels to Bali to source more one of a kind, handmade goodies for the upcoming QAC webstore Fall relaunch ... This week’s Daily Fashion Fix style post is a dope cultural spin on an old classic - "The Fanny Pack." Welcome back to another week of The Daily Fashion Fix. This week's global goodies comes from the vibrant country of India! Long time readers know I absolutely love when vintage style and global history come together in one piece. And this weeks dress? ... A 1970's vintage sari styled dress directly from India is exactly that! Historically saris have been worn in Nepal, Pakistan, Bangladesh, and Sri Lanka and most famously India for centuries. Angela from Queen Adwoa's Closet here! This week on The Daily Fashion Fix, I'm reporting live from Bali, Indonesia! ... As always, you know a really cool blog and video post is coming on my adventures, but in the meantime? Let's get into this chic jungle - ready vacation look! Welcome back to another fun "Daily Fashion Fix" post! This week, I'm sharing a super quick tutorial answering the question I receive the most all over my Instagram feed ... How do I create the beautiful headwrap styles that have become a fashion staple in my everyday look? After an overwhelming yes response to a recent Instastory poll, how could I say no? 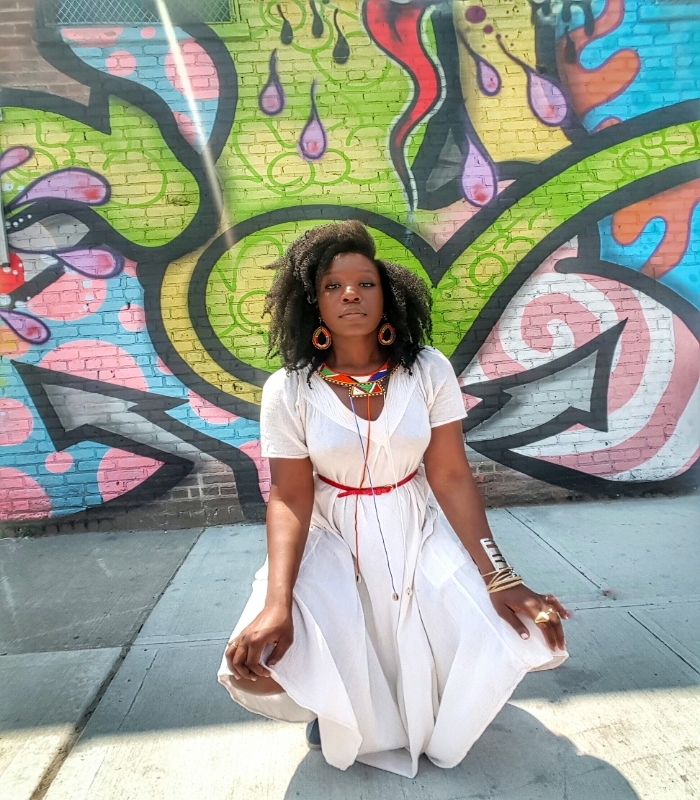 In the last Fashion Fix post, I talked about my journey to fully embracing my African heritage. Way back when, one of the 1st ways I began to reflect my Ghanaian culture was through adopting West African fabrics and incorporating unique headwraps into my look. ... But they have become such a part of my life and self-identity, that I can't imagine ever going back to not wearing them at all. It's with incredible pride that I share just some of my favorite headwrap styles with you. This video, was made especially with beginners in mind ... In the hopes that you grow to love them as much as I do! 'Till next time, as always, The Journey Continues! Anywho, in last week's Fashion Fix post, I talked about the need to wear modest clothing when in public spaces here in Qatar. That said, back when I was in the packing stage, I had the hard job of going through literally every item of clothing I owned and deciding whether it would make the cut and make it into my luggage ... Or end up in the trash / donation bin. It was in this "toss it" or "take it" phase that I came across this beauty greeting me from the back of my closet. 100% West African wax print fabric ... Hand embroidered ... 20+ year old vintage dress straight from my dad home country of Ghana, West Africa. Returning after a long hiatus with a new Daily Fashion Fix post. In his week’s installment, I decided to take another stab at restyling a modest look since moving abroad. That said, my new country of residence, Qatar is no different than many other countries across the Middle East. The rule is to cover from knees to shoulders, w/ arms covered preferably to the elbow (but a t-shirt length is passible when outside of work or government buildings) .. Yall, this is DEF a shift from my nudist / bodycon wearing, free-spirit self who loves to push boundaries! ... It's not easy, but I think I'm making it work LOL! Also, in addition to a quick convo about modesty, I also wanted to talk a bit about these images and the duality of my new city. I’ve already made some really great friends here and I’ve have some amazing times thus far, but I also want to share the other side ... The story of expats from other countries working really hard, yet clearly not living the same type of life experiences my friends and I are. While it’s easy to post beautiful photos, I also want to share what’s real. As a black woman, as a Caribbean woman, I myself have had experiences here that were not always positive due to stereotyping and assumptions of class, poverty, etc, based solely on the dark complexion my skin and the history of blackness here. Clearly said? I want to be able to share authentic experiences of people of color who are in these spaces. It would be inauthentic to myself or the people I’m sharing this journey with, you my online fam, if I chose not to talk about these issues and strictly showed Insta-worthy vacation shots for however long I'm here ... Now, don’t get me wrong, I like those things .. Love them actually. However, it would be irresponsible of me to not acknowledge the huge population here whose labor is the backbone of this society, making this “fancy” lifestyle possible for a very select few. I feel it’s my duty to shine a light on them. In short, the art direction of this week’s photos were to show this dichotomy .. To show the contradiction .. To show and the beauty against the gritty. Ok fam, that's all for now. I hope you loved today’s fashion post! ... PS: If you liked the photos, you’ll LOVE the fun lookbook video I put together to celebrate this week’s style! ... Check it out below and let me know what you think! UPDATE! - For full details on my trip to the Bin Jelmood Museum, which discusses the history of the Arabic slave trade her in Qatar as well as modern manifestations of slavery and indentured work ... Tap HERE! ‘Till then, as always ... The Journey Continues! 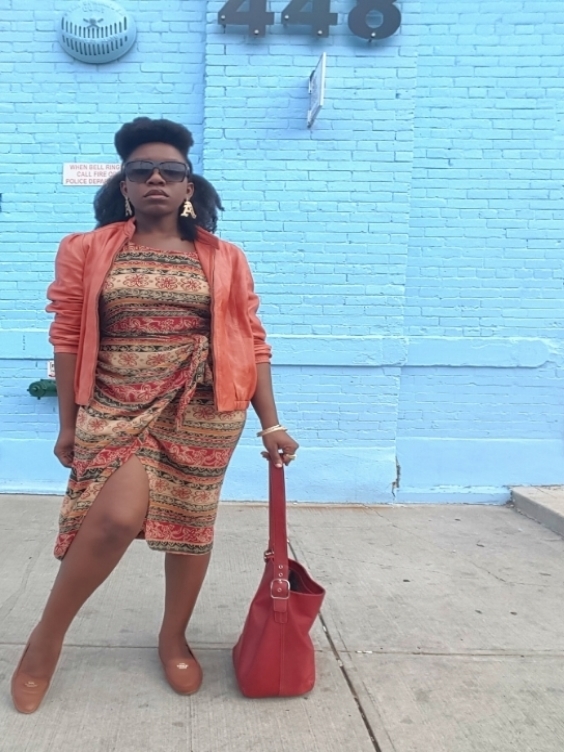 Angela here, owner of Queen Adwoa’s Closet checking in live from the concrete jungle with, as always, another “globally classic” piece … This time? All the way from Peru! … Quick back story? I decided do a bit of garment hunting in Brooklyn recently in a super hush location (blog post on that next week) when I came across a few cute gems and yet another showstopper piece. Early on in Q.A.C’s launch I wrote a pretty in-depth blog post on the basics of thrift shopping. If you haven’t read that particular entry yet, I highly recommend it. That write up, in addition to next week’s post, is pretty much my “how-to” bible on scoring really dope vintage in a sea of what are basically toss-outs from other people’s closet ... Or are they??? There's amazing treasures to be found if you know how and where to look! At any rate, as I’m sifting through a bottomless pit of clothing piles, my friend Rosie hands me what initially looks like a blue blanket. Eyebrows furrowed, I start opening up the fabric thinking, “what the heck is this! ?” .. Seeing the puzzled look on my face, she asks, "well, do you want it or not?" Clearly, if it made it to this blog post, I was definitely impressed LOL. What initially looked like a couch throw blanket turned out to actually be a Peruvian poncho, called a “Lliclla” or "manta" by the Quechua people. In Peru, which was founded by the Inca people, and where the main mode of transportation was (and in some remote locations, still is) by Llama … Both aspects celebrated in the unique design of this particular wool cover-up .. The Lliclla is often worn by women who favor the traditional Quechua style of dress. Culturally a mashup of indigenous dress with colonial Spanish influence, this covering is primarily used to protect the women from the cold as they navigate chilly Andes Mountain air. For those women with children, it's also used as a body wrap to carry their little ones while completing tasks outdoors. While this traditionally colorful wool is worn around the neck and secured by either tying, a pin, or button .. Even more colorful the mantas are worn for holiday's and festivals. In short? To say I lucked up on this incredible find is an understatement, LOL! And? .. I just might be adding this beautiful cover-up to the QAC webstore .. Perfect for late spring nights or an evening at the beach. Interested? Awesome! Follow the Q.A.C shop on Instagram for announcements! New items arriving soon! Till then? As always ... The (fashion) Journey Continues! What I love about this dress, is not just the rarity of it, but also the heritage. Throughout this dress are patterns and images of the indigenous Inca people. Briefly, the Inca were a members of an empire which spanned South America from Columbia to Argentina before the arrival of Columbus and other colonialist. With over 10 million subjects, the Inca dynasty was the largest empire of its time! In addition to their development of 30 languages, commission of national roads, and temples, the Inca developed a distinct style of art that remains recognizable to this day. Below, are a few of the shots I took in Central Park over the weekend wearing this amazeballs dress, along with images of ancient gold / bronze Inca artifacts found depicting the Inca people's sacred sun god deity. They considered themselves "Children of the Sun". As you can see, these same patterns and images were incorporated into my dress. In short? This dress is exactly what I mean when I say that my personal style is a collection of global vintage with a modern aesthetic. A mint condition, handcrafted vintage item which also happens to acknowledge and celebrate a powerful ancient culture? ... How could I not!? ... Regrettably my fashion loves, this dress will not be listed in the Q.A.C webstore! I've fallen hopelessly and completely in love with it! LOL There are some fashion finds that are absolutely priceless. :]) .. No worries, when the Q.A.C shop launches with new pieces this June, you'll totally forgive me. Even more global pieces awaits! ... 'Till then? As always, the journey continues! Hey Royal Fam! ... Angela of Q.A.C back again this week sharing another one of my favorite cultural fashion creations. 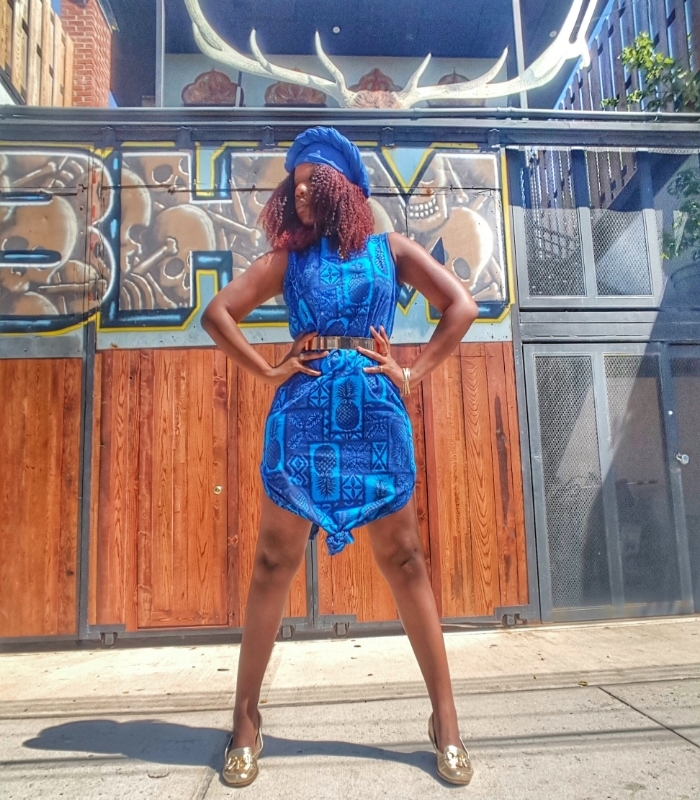 This week's go to was a beautiful wrap dress I created from a body wrap batik fabric I often multi-use as material for headwraps, tops, dresses ... You name it. If you've been following my personal page on Instagram, you've seen me post on the importance of acknowledging the wide array of African fabrics outside of the ever popular dashiki and kente cloths. 2: Over the centuries and through ancient trade routes over 2,000 years ago, the art of creating this fabric travel through Asia, Egypt, and ultimately Africa ... More specifically to Nigeria (with the Yourba people) and in Senegal. 3: In creating batik fabrics, particularly in Africa the process is done by stenciling a thick paste (made of cassava in Nigeria / rice in Senegal) on cotton or silk, by hand. 4: Once the paste dries, the fabric is dyed, then left to dry. Once completely dry the paste is removed and the white handcrafted design art is made visible. Cool right?! ... The particular fabric I'm wearing in this week's feature is made from the Senegalese fashion using rice paste .. And I absolutely love it. For deets on my D.I.Y dress creation and how you can replicate this dress yourself at home ... Trust me guys, you've got this! .. Tap HERE! Alright, that's all for now. As always, 'Till next time, the journey continues! It's 65° degrees here in NYC today, so you know what that means ... Either global warming is going into overdrive this week, or Spring is almost here!! .. I'm going to think positively and go with Spring LOL. That said, I took advantage of the amazeballs weather by grabbing my camera and shooting downtown! .. Hope you enjoy! This week's Daily Fashion Fix feature is another super cool cultural piece from Kenya called "shuka cloth." Seen in the nomadic Maasai Tribe of East Africa, the shuka is worn as a protective garment while out in the in the field, either tending to cattle or on the hunt. Originally, created by taking and processing red ochre clay from the earth, historically, the red coloring in shukas held important significance in not only helping tribesmen camouflage from wild animals by blending into the terrain .. But also serving as a warning signal to aggressive animals when discovered (warding them off) as warriors set out on the hunt. Today, shukas can be wrapped and worn in countless ways, as its style often varies by the creativity of the wearer. For a bit of style inspiration, check out my modern take on rocking shuka cloth in this week's post! As you all know, I love all things vintage. For this look, I brought together a plush butter leather 1980's crop jacket ... A simple body-suit .. And a pair of super distressed high-waisted vintage mom jeans. Can you tell I wear these a lot? No seriously, they're probably going to fall apart any minute with all the fraying, but I can't let them go .. LOL! Shoes included these gold booties I was gifted by my mom, practically unworn from last winter. 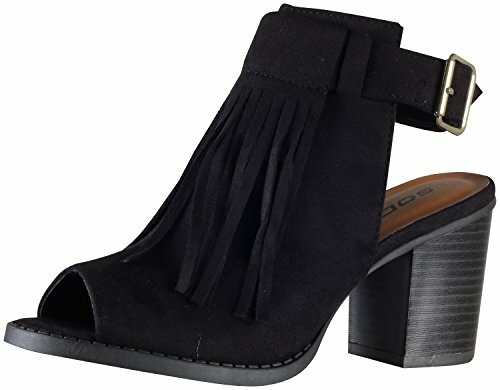 They honestly had to grow on me style wise, because I wasn't originally a fan (sorry mom!) .. But I'm so glad I decided to keep them. LOL .. And there there you have it! A few classic basics paired up with a unique statement piece and you have a really cool look all your own. As you all know, I'm a fan of a good cultural or vintage piece ... Finding a cool garment or accessory that combines the two? .. Absolutely love! This week, I was able to find just that. From being used to connect with the gods .. To symbolizing wealth, health, and good luck .. Cowrie shells have long been regarded as both culturally & spiritually important in African, Asian, Arabic, & Pacific Islander culture. While I've been drawn to cowrie shells recently, as you many of you know, I also really like the idea of wearing a garment with deeper symbolism and meaning. This vintage 1980's kimono I found while out on a recent vintage hunt, gives a stylish nod to the historic use of cowrie shells, while also celebrating indigenous people in the beautiful patterning. Stylish .. cultural .. with a bit of history. The perfect fashion trifecta! As always, we know the foundation of quintessential Q.A.C style is the beautiful marriage between quality vintage pieces juxtaposed with amazing global selections … And this week, is no exception! Today’s look inspired by luxe style for the global and environmentally conscious, young creative. Like so many, as I grow into my own personal style and self-discovery, I’m moving away from trendy, “style of the moment” pieces and toward a more timeless aesthetic. Nothing’s worse than spending your hard-earned money on the coveted fast fashion “must haves” … Only to have it be deemed “out of fashion” the following season. Listen, I don’t know about you, but my coins are far too precious for that! … LOL! Instead, now more than ever, I’m all about investing in unique conversation pieces with longevity. My wardrobe consists of selections that not only lessen my impact on the environment, but also communicate my close connection to global culture. This week I chose a few select pieces from opposite ends of the globe, which highlight these concepts … Proving once again, that quality is always better than quantity. First up? We take look at the beauty of African nation, The Congo as brought to us from JORD Watches. If you follow me on Instagram, then you might have seen my “Instagram Story” excitedly hinting at a mystery box recently arriving in the mail. As a West African girl myself, and an avid collector of global accessories, I was beyond excited to add this piece to the collection. y loves? The classically understated navy watch face paired with the rich zebrawood stripped coloring of the wood. If you’ve been reading the Daily Fashion Fix for some time, then you’ll know that pairing of a solid statement color with an engaging print (be it subtle or bold) make for the perfect jumping off point when creating an amazing outfit using my “Color Pop Method.” Additionally, the simplicity of design also makes it easy to build upon if like me, you love accessories and a good arm party! 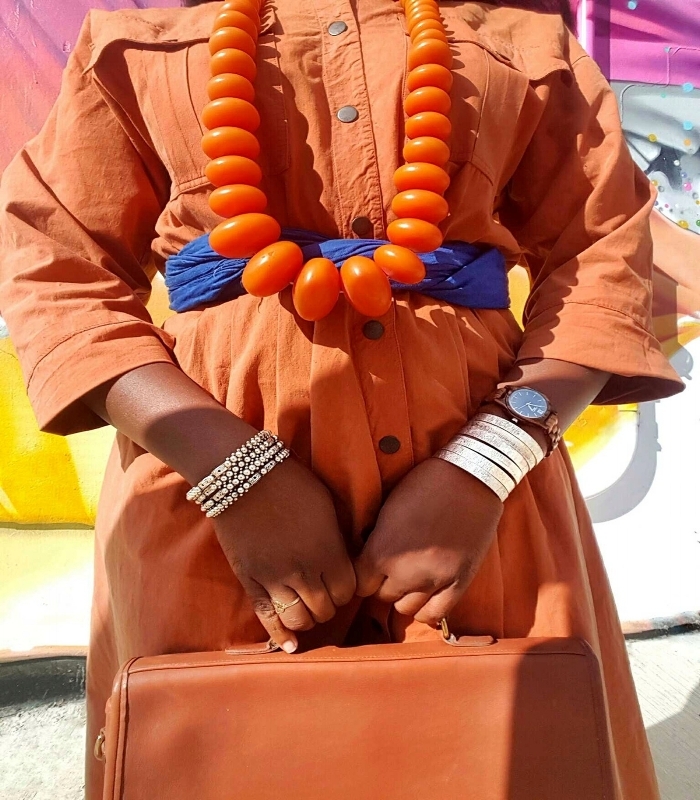 Here, I paired my JORD watch with vintage bangles direct from India and an amber necklacefrom Gambia, W. Africa ... As you can see, I’m entering full eccentric fashion mode and I love it! LOL! Last, but certainly not least … To know me, is to know that I’m a huge proponent of ethical and sustainable fashion. No amount of style is ever worth owning large amounts of clothing created from factory sweatshop labor or deriving from a company with a large environmental footprint. What I absolutely love and applaud JORD for is the transparency of sourcing. While the sustainability on my Frankie series Zebrawood watch could be a bit more on the eco-friendly side, several of the global wood materials used to create their luxury watches certainly are. Not only do they outline the country of the wood’s origin, but they also indicate the levels to which the tree / wood materials are considered “at risk.” In essence, you’re shopping pieces based on both personal style as well as your level of environmental comfort. Does your fashion fave do that? Finally, as we head to Europe, Paris specifically, I decided to pair my accessories with this super chic vintage dress from none other than fashion house Lanvin! With a keen eye for vintage shopping, I was able to spot and snag this 50’s styled, A-lined dress from the luxury designer for under $100! ... An amazing deal, when considered many dresses from this designer can start at $1,000 each. In all, by shopping vintage and quality pieces, you’re incorporating pieces with longevity that you’ll literally have for years ... Ultimately reducing the pull on natural resources and impact on the environment ... All while looking amazingly unique in the process! And that always a great look! Tap HERE to replicate this colorful luxe look! Tap HERE for details! on how to enter! Last go 'round on the Daily Fashion Fix, we talked about how to recreate a great Fall transition look in just 3 easy steps! This week, I'd like to keep on this vein and take it one step further with layering. As the weather gets cooler, adding a few basic chic layers over a bold statement piece can take your fall outfits from yawn to yes! In this week's example, the foundation of my look is a bold dashiki print romper I custom designed myself for the Q.A.C webstore. Dashikis, originally worn in West African nations such as Nigeria, Togo, and Benin .. The print evolved during the 1960s into political statement of African-American pride and solidarity .. With the energy of the world, ESPECIALLY here in america .While great in the summertime, with a few tweaks, this romper becomes a fierce transition piece ... And who doesn't love getting double duty from your wardrobe?! To warm things up a bit, I begin layering my basics over this romper using my previously discussed "Color Pop" method. Blue tights with a blue cardigan serves to color block an already busy dashiki design. The same is idea is repeated with oxblood toned boots and classic leather moto jacket. In both cases, these colors are added to both the top and bottom of the outfit to not only add a sense of uniformity, but it also anchors the entire look around the dashiki print. As a special note, take a look at the length of each cover-up. The shorter length of the leather jacket .. Followed by the bit longer length of the cardigan .. Then finished off by the longest length, the romper. This layering of materials on top of one another, coupled by the different layered lengths create this great structural look visually that I'm absolutely in love with. To wrap things up, I cinch my waist with a thin belt because as you know, I absolutely love a good hourglass shape! And there you have it! Another fun look brought to you from Q.A.C, with several basics from your own closet! Colder weather is when the real fashionistas shine ... That said? Let's get layering! The thought of children being born with special gifts isn't a new concept. Cultures all over the globe have acknowledged and celebrated certain individuals or children with "gifts" throughout history. The origins of "Indigo Children" or "Star Children" is no different. Arising in the 1970's, the term has come to identify those with a special connection to psychic and spiritual abilities. Those who are born with these gifts are often confident, intuitive, clairvoyant, creative, and at times reclusive ... preferring to be around other like minded sensitives. To know me, is to know that I love all things mystical, spiritual, and otherwise "otherworldly". While there's much speculation as to how factual these indigo claims truly are, for me there's no question that the presence of spiritually inclined ... magically gifted individuals exist. I would even venture to say, I am one ... But that's a post for perhaps another day : ]. This week's fun ensemble is a tribute to my fellow mystics. Deep indigo dress (vintage) with double slits offers a fun way to play with styling .... While the gold accents on the dress, belt, and shoes, are present to represent the illumination of the stars. I also happen to be a fan of this dress for its patterning. layful pineapples paired with the adinkra symbol of "Bese Saka" (symbolism of affluence) was a great and unexpected surprise as it incorporates both my tropical / caribbean and Ghanaian heritage. This dress is definitely a new fashion staple for my personal closet! Anytime one attempts to talk about religion, there's always hesitation ... especially when the religion in question is one that has so many misconceptions surrounding it. This is undoubtably true when it comes to the practice of Santeria. Born out of the devastating slave trade, Santeria originates from the large number of Yoruba (Nigerian tribal group) African survivors which ultimately were brought to Cuba and forced to practice Catholicism in leu of their own religion. Being the survivors that they were, these Afro-descendants, while practicing the new Catholic religion also incorporated several aspects of their african spiritual traditions into the faith. From this co-mingling of traditional worship and colonialism emerged the practice of Santeria. Within Santeria a peace is made where similarities within both faiths are found. African deities and Catholic saints are prayed to equally without conflict. Within this new community, new initiates, called "Iyawos" wear white and undergo a yearlong rites of passage filled with ceremonies, restrictions, new practices. The act of wearing all white is a form of rebirth symbolizing purity, peace of mind, and spiritual clarity. Due to the unfavorable feelings at times for all things "Africano" on the island, particularly misunderstood religious practices and rituals from the continent, Santeria was not always welcomed and therefore continues to be practiced quietly within tight communities worldwide. Like so many of african descent living within the diaspora, there comes a point where a merging of cultures occurs ... The clash of two worlds is never an easy one. In the case of the Santeros/as (Santeria practitioners) in Cuba, they were able to find a home under assimilation, untimely like so many others, creating a beautiful new aspect of their culture ... something uniquely their own. 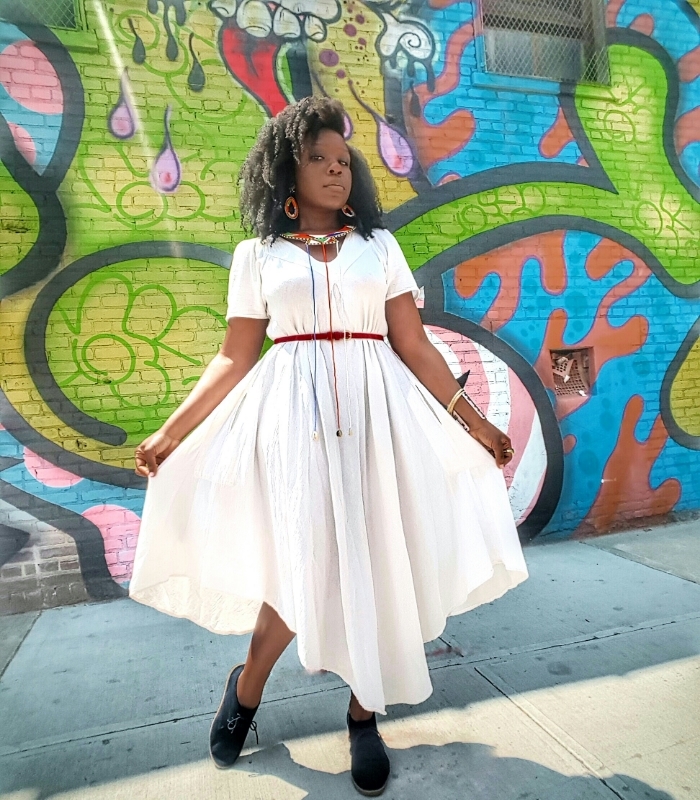 Quick Fashion Fix post to showcase one of the newest fashion faves for my webstore Queen Adwoa's Closet ... along with this super easy wrap dress you can replicate in seconds! First up, let's talk about this dress. Festival season is here and summer is right behind it. One of my "never fail" go to looks is without a doubt the wrap dress. 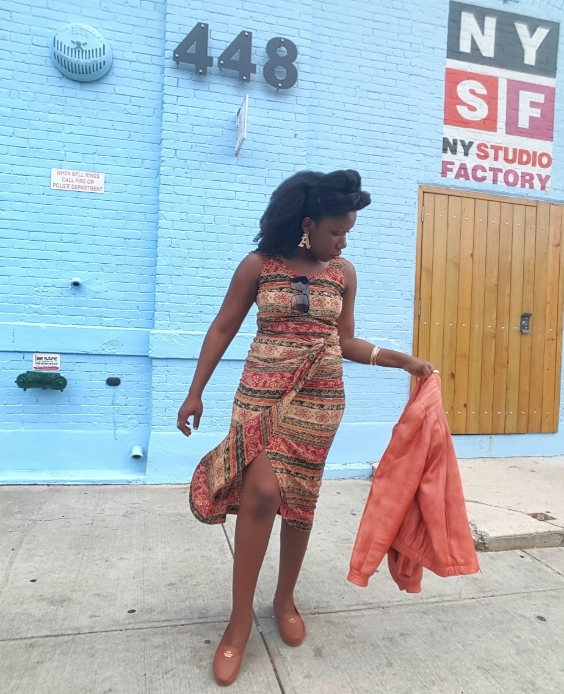 Made famous in the fashion world by designer Diane von Fuerstenberg, the island wrap dress has been worn by stylish women throughout the diaspora for centuries. Mastering the look a quick D.IY look with fabric is unbelievably simple and can be done in 3 simple steps. 1) Grab your Q.A.C body wrap or favorite piece of material. While in this example, mine has a bit if fringe, it's not crucial to the look. However, if you'd like to add a bit of fringe, using scissors to cut small slits, close together along the width works just as well. 2) Wrap the fabric around your body and tie the ends into a knot around your bust. Tuck the loose ends into the top of your bust. 3) Secure the bottom open ends of the dress by either tying the fringes together or by using safety pins to secure the material. If you decide to use pins, use them to secure from the underside of your dress to hide them. If you're like me and like a nice cinched waist, you can add a thin belt to highlight your shape ... And that's it! Your done! .... Super cute dress for the cost of approximately 2 yards of fabric. Whether you're in need an outfit for a special event, work, or weekend escape ... Being able to create what I call a bit of "origami magic" with an amazing piece of fabric can me so clutch. This week's fabric of choice is a kente print body wrap coming soon to the Q.A.C webstore. Quality body wraps have been a long time closet staple of mine, as it allows me to create multiple styles from one great swatch of fabric, including: dresses, tops, blouses, head-wraps, skirts, etc ... Something any budget friendly fashionista would love. For a fun "how to" tutorial on how I created this dress with ONE piece of fabric, click here! To top off my look I wanted to showcase the newest addition to my fashion house's accessories collection. In this week's "Cultural Beauty" section, we discussed the heritage of the Wodaabe / Fulani Tribe and the tradition surrounding their beautiful Kwottenai Kanye earrings. In growing my fashion house, I've partnered with artisans from Mali, W. Africa to offer these amazing one of a kind earrings within my shop. Handcrafted in brass then hand-dipped in 14 gold, these earrings are guaranteed to be show stoppers! The fashion world is abuzz with it's love of vintage. From major retailers to your favorite indie blogger, like myself ... the excitement over all this "old school" has never been higher. Even my own web fashion house Queen Adwoa's Closet has high quality selection of quality vintage pieces for purchase. But, as the love for vintage pieces grows, and seemingly everything is being attached to the term "vintage," what exactly is it and what qualifies an items to be called vintage? The official rule of thumb is 20 years. Clothing items, accessory pieces, shoes, styles, ect originating from a time period of over 20 years can be considered authentically vintage. That skirt with a vintage feel, but manufactured 3 years ago is certainly not vintage. However, that well crafted 60 year old dress from your grandmother's closet? Definitely vintage. As mentioned previously in my post on Learning to Shop Vintage, identifying quality vintage doesn't have to be difficult. 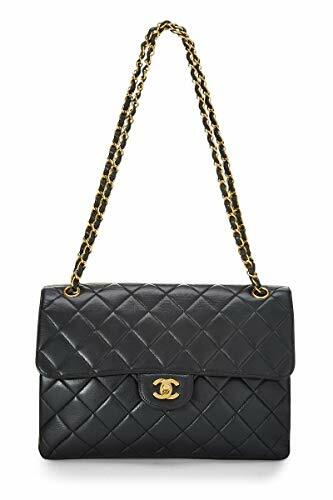 Label tags, fabric texture, year of creation, stitching are all viable ways to identify vintage impostors with mislabeling from the real thing. Retro items on the other hand, are throwback pieces which have a bit of age to them, but have not matured enough to be called vintage. To the contrary, retro items are quality pieces that are at least 10 years old ... wardrobe staples from yester - year that had the height of their popularity not long ago, but still too young to achieve iconic vintage status. This weeks outfit is a mashup of vintage looks from various time periods. Case in point, this Adinkra symboled, scalloped shaped, silk wrap-dress is direct form my personal closet ... And I've worn it since middle school! Yes, you read that right. I've had this dress since middle school (I've been tall since forever lol). I love this dress and the look and style is absolutely timeless. The leather jacket if vintage from the 1980's. Pompadour hair-style is from the 1950's. Again, these fashion points all derive from eras well over 20 years, yet when pulled together they all work effortlessly. Kente Cloth is the hallmark fabric of Ghana, W. Africa. It's use throughout Ashanti culture and history (one the major Ghanaian tribes) is world renowned. From the exclusive use by royal families and statesmen ... to its use during special events such as weddings and funerals, the various patterns and colors of kente played a significant role in daily tribal life. 1) The kente print is much lighter, where as yards of traditional kente cloth has a bit of heft to it. 2) Kente cloth is made traditionally, on a loom by artisans ... where as kente print is often made in factories that duplicate the traditional design. 3) The price point for authentic kente cloth is much higher than regular kente print. While it's wonderful to have true kente cloth (and I personally advocate for shopping authentic when possible), some find kente print to be more financially accessible. Traditional kente cloth can cost hundreds of dollars per yard. To honor my royal Ashanti tribal roots, my dad is an Ashanti chief, I often like to pay homage from time to time, by wearing and designing with kente patterns. Here, I'm wearing a classic kente print dress. While kente is an older global fabric, there are so many ways to add a modern feel. To learn more about traditional kente cloth, click on the following video!